This past weekend's Coachella Festival will be remembered for a looong time, and has already blown minds worldwide, all due to the performance on stage of the one and only Tupac. This is the coolest thing I've seen in a long time, and takes me back to the days of mid 90's when Snoop, Dre and Pac were kings. 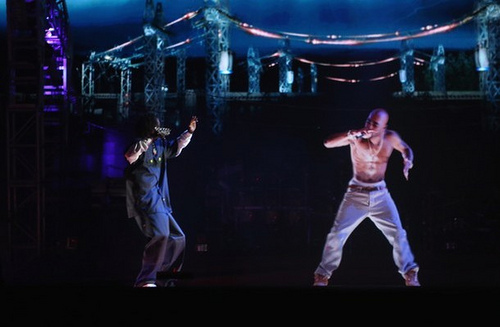 After seeing Tupac's performance, you could be forgiven for thinking a more likely explanation is that Tupac's ghost had appeared to hit the stage one last time with Snoop, rather than a hologram. I could only imagine how epic it would have been to be there in person. Technical wizardry and sorcery aside, it was slick, realistic and downright bangin. When Snoop joins Tupac on stage, its seamless, and its as though they are really interacting. It was hard to believe that Tupac was really killed 16 years ago. "Two of America's most wanted in the same muthafuking place at the same muthafuking time"
Tupac performs, forever young, and ripped in his 25 year old body, while Snoop is still hitting the stage and busting rhymes 16 years later, now as a legend and elder statesman of the Gansta Rap game. 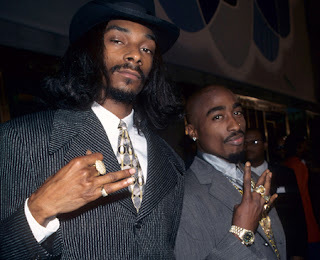 It makes you think that if Tupac hadn't been shot back in '96, this scene of Tupac and Snoop on stage would have been exactly the same, although Tupac wouldn't be frozen in time, and would probably have a bit of extra padding behind his Thug Life tatt. It was a great way to remember Tupac, and show respect to a guy who music still stands up today just as much as it did in the 90s. Not sure who was on stage next, but a tough act to follow that's for sure.